More big doings at the Film Noir Foundation, kids. And what better time to launch a project long in the works than when FNF honcho Eddie Muller is serving as host of TCM’s Summer of Darkness? The FNF’s quarterly magazine is called Noir City. Eddie is publisher and editor-in-chief. I’m co-managing editor along with the estimable Steve Kronenberg. Gorgeous visuals come courtesy of ace designer Michael Kronenberg. Each issue is packed with some of the finest writing on noir past and present, in every medium. And each issue is available by subscription only. At our new website, you can purchase individual back issues for the bargain price of $5.99 each! 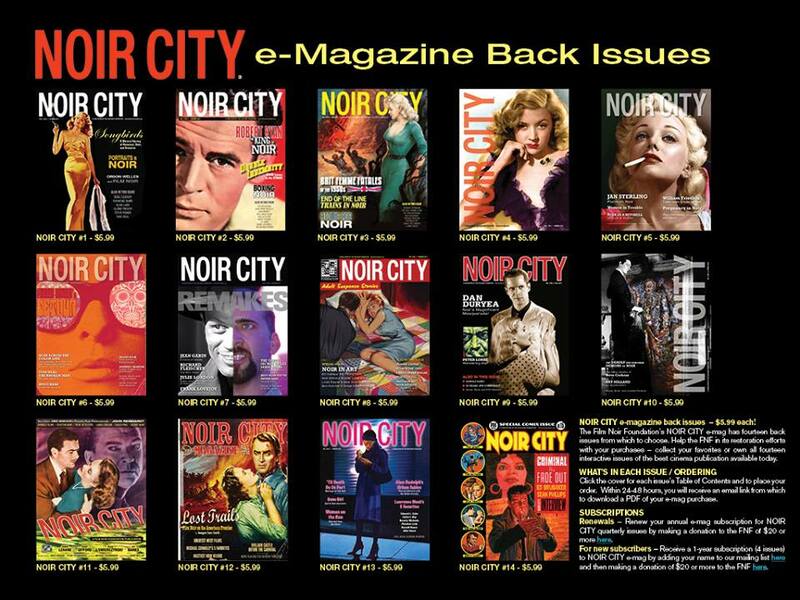 Peruse the table of contents before you buy, knowing whatever particular noir kicks you’re seeking, Noir City has you covered. We’ve got theme issues on icons like Robert Ryan and Dan Duryea. We go way back for regular features on silent movie noir. We’ve got invaluable work from regular contributors like Imogen Sara Smith (on Jan Sterling, Jean Gabin, noir westerns) and Jake Hinkson (on Tom Neal, Peggie Castle, and those unsung directors known as Poverty Row Professionals). Not to mention Eddie, the man himself, weighing in each and every issue. Noir City’s also your destination for crime writers on noir. Like Christa Faust on noir vixens of recent vintage. And an overview of heist movies featuring the likes of Ken Bruen, Laura Lippman and Scott Phillips. And Five Favorites, with masters like Dennis Lehane, Michael Connelly and Lawrence Block giving you their quintets of quality. And Prime Cuts, spotlighting neo-noirs like Cisco Pike (Duane Swierczynski), Thief (Wallace Stroby), and The Offence (Ray Banks). Plus there’s the stuff I’ve written over the years, on subjects like noir chanteuses, remakes, marriages, True Detective, dollhouse murders, and the films of Alan Rudolph. Six bucks an issue, with all proceeds bankrolling the FNF’s restoration efforts. Throw in twenty bucks a year and each new installment will come right to your in-box. Do it now, because we just laid out the latest magazine – and it’s a killer.